An epoxide is an organic compound consisting of a three-atom ring. 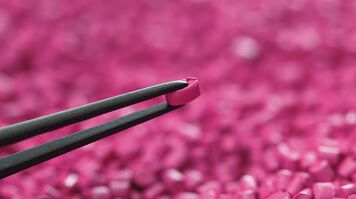 They are the raw materials for a broad range of products, from pharmaceuticals and plastics to paint and adhesives. However, production of epoxides can be expensive, especially on a large scale, as well as damaging to the environment. Dr Misbahu Mohammed has undertaken research in epoxide production aimed at combating these issues, with the ultimate goal of making epoxide production cheaper, more environmentally friendly, safer and more flexible. Dr Mohammed’s work involved adding oxygen to an alkene molecule, which created a cyclic epoxide – an important chemical intermediate. It’s a useful reaction in organic synthesis, as the epoxide is a highly reactive compound that is used as a raw material or intermediate in the production of commercially important products such as flavours, fragrances, paints and pharmaceuticals. Dr Mohammed’s experiments were carried out using a reactive distillation column and a FlowSyn reactor. They showed considerable time savings, high reproducibility and selectivity, and a remarkable improvement in the stability of the catalyst when compared to the reactions carried out in a batch reactor. Dr Mohammed is hopeful that his technologically advanced process can be used by epoxides manufacturers who will be saving money as well as gaining a superior product. The process could also be further modified to improve stability and catalytic performance so it can be used in the synthesis of other valuable epoxides.